Highly versatile free standing FS DC 180° inverter with dual clamps. The FS DC Inverter can be loaded by forklift truck or at ground level by pallet truck with either ramped access or flush to floor tables. Floor flush tables are ideal for product which can be clamped tightly. All FS DC Inverter machines are painted with two coats of zinc primer and a 2 pack epoxy acrylic top coat as standard. The standard unit handles loads up to 2 metres and down to as low as 600mm in height while the loading capacity is 2000Kgs. The FS DC is the most versatile model in Premier’s range. 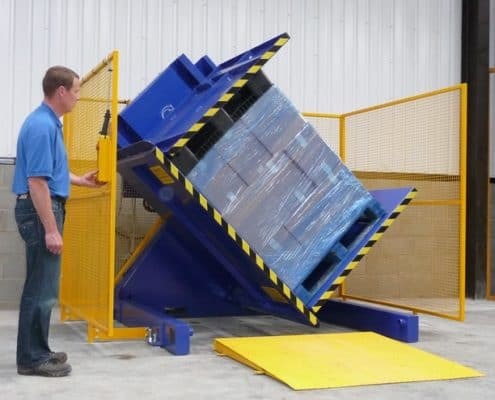 It can load by FLT or at ground level by pallet truck and can handle loads from 600mm to 2 metres in height. The “DC” stands for dual clamp. 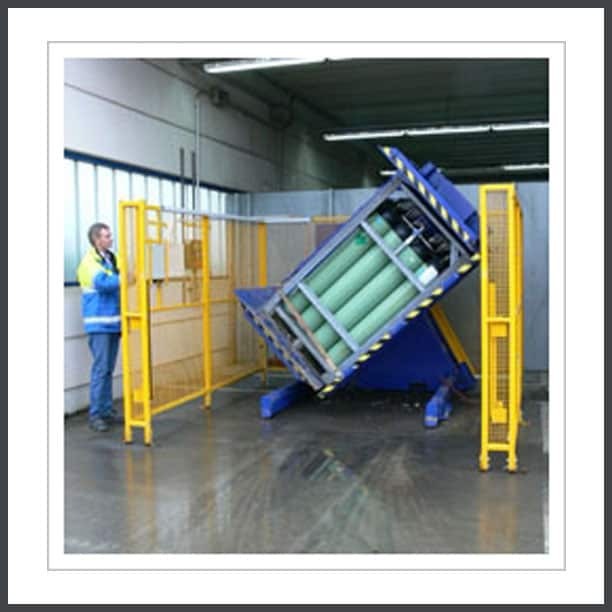 Its strong construction combined with a 2000 kgs capacity makes it suitable for the harshest environments. 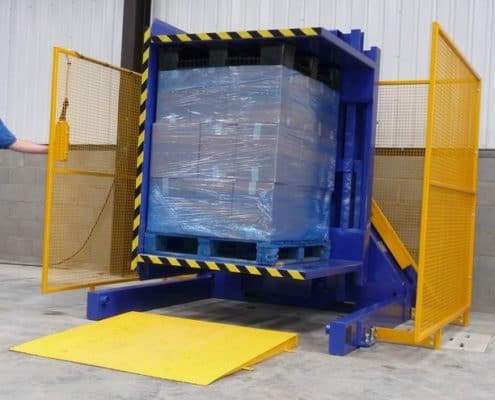 It is a machine that will run and run in the busiest warehouse or cold-store despite the most abusive treatment. Although it will operate perfectly well without special installation, the FS DC is normally anchored to the floor. Basic guarding is included in the package, though many customers opt for a floor-fixed cage with photo-electric guarding at the front. 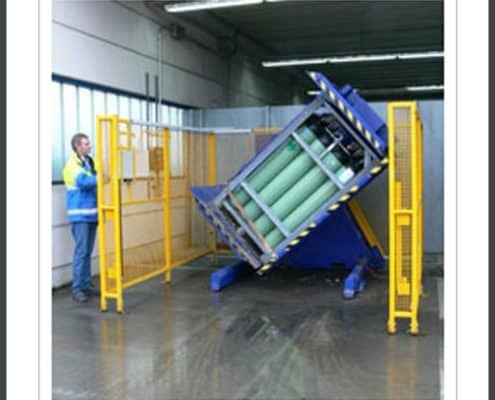 Like the FS, the FS DC will transfer almost any kind of product from pallet to pallet. It is equally at home with sacks of food ingredients, piles of paper, tinned goods or boxes of crisps. 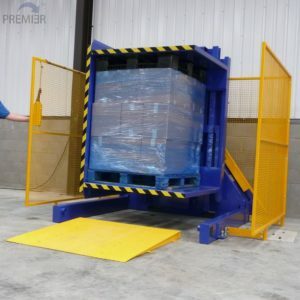 Machines are always held in stock at Premier’s Norfolk factory and are also available for rent or trial on site. 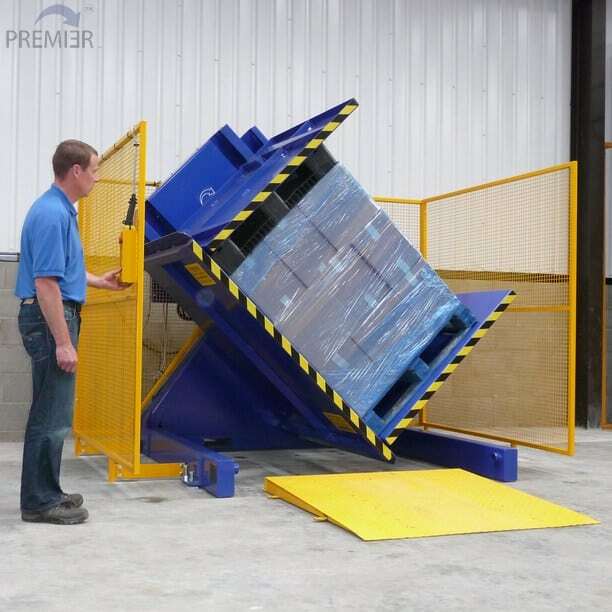 Al Thika Packaging company is the exclusive distributor of Premier Pallet system in the Middle East. Since 1994 Al Thika Packaging has been providing a wide range of machinery includes Pallet Inverters, Pallet Chargers, Pallet Dispensers and freezer spacer for food & non-food industries in Dubai, Abu Dhabi, Sharjah, Fujairah, Ras Al Khaimah, Ajman, Umm Al Quwain, Al Ain – UAE, Saudi Arabia, Muscat, Oman and the many other Gulf countries.